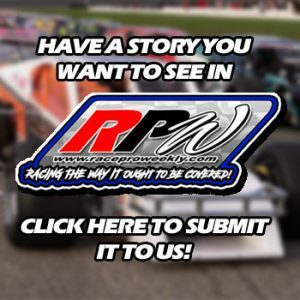 Story By: SCOTT RUNNING / STAFFORD MOTOR SPEEDWAY – STAFFRD SPRINGS, CT – Stafford Speedway hosted the Bud Light Open Modified 80 with tour style modifieds taking center stage for an 80-lap race around the Connecticut half-mile. Eric Goodale used a great pit stop to climb from seventh to second after a round of pit stops and he led the final 41 laps to win the Bud Light 80. 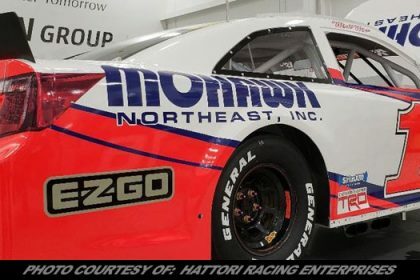 The SK Modified® division ran their regularly scheduled 40-lap feature as well as the TC 13 Shoot Out, a 13 lap race with the top-13 finishers from the 40-lap feature inverted in memory of Ted Christopher. 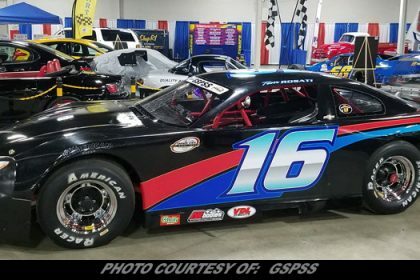 Eric Berndt won a thriller in the 40-lap SK Modified® feature, outdueling Ronnie Williams for his first win of the 2018 season. Glen Reen came up the big winner of the TC 13 Shoot Out and he took home the winner’s check of $1,313 along with a $113 bonus. 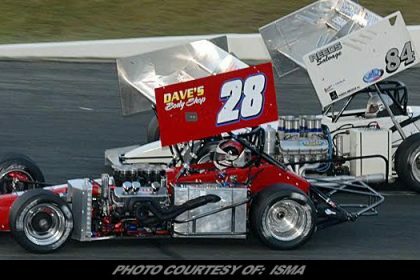 Other feature winners included Tom Fearn in the Late Model feature, Bryan Narducci in the SK Light feature, Jeremy Lavoie in the Limited Late Model feature, and Tess Beyer was a career first time winner in the Street Stock feature. 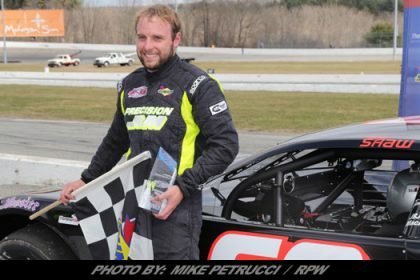 Michael Christopher, Jr. took the lead at the green flag with Rowan Pennink, Jeff Gallup, Andrew Molleur, and John Montesanto lined up behind him. Molleur took to the outside groove and he want from fourth to the lead on lap-3. Gallup took second from Christopher on lap-5 while Dave Etheridge took fifth. Montesanto spun in turn 4 and collected four other cars including Tommy Barrett, Jr., Richard Savary, Eric Goodale, and Brett Gonyaw to bring the caution out with 5 laps complete. Molleur took the lead back under green with Keith Rocco working his way up to second. Gallup was still third with Chase Dowling up to fourth and Ronnie Silk up to fifth as Christopher slid back to sixth. With 25 laps complete, Molleur was still in command of the race with Rocco, Gallup, Dowling, and Silk lined up behind him. Christopher was sixth with Eric Goodale, Etheridge, Pennink, and Joey Cipriano making up the top-5. Rocco was beginning to close down the gap to Molleur for the lead when the caution flew with 39 laps complete for Mark Bakaj, who came to a stop coming out of turn 4. Under the caution the leaders came to pit road for 2 fresh tires and adjustments. 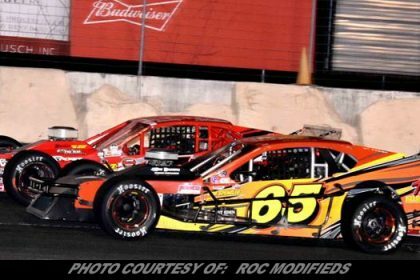 Molleur stayed out on track while Goodale won the race off pit road with Cipriano and Dowling on row 2 for the restart. Goodale took the lead from Molleur on the restart and Molleur started to quickly fade backwards. Dowling took second with Silk third, Cipriano fourth, and Gallup fifth. Molleur came to pit road 4 laps after the restart where his crew took a look at the car and sent Molleur back out. The action behind the lead trio of Goodale, Dowling, and Silk started to pick up with Pennink moving into fourth and dropping Cipriano back to fifth. Rocco was up to sixth after having to come to pit road twice under the lap-39 caution as he missed his pit box. Rocco took fifth from Cipriano and he took fourth from Pennink on lap-54. Rocco was quickly closing down the gap to Silk in third and by lap-60, he was right on the back bumper of Silk. Rocco took third from Silk on lap-61 with Goodale and Dowling still out front. With 10 laps to go, Goodale was still in command with Dowling several car lengths behind him in second. Rocco was still almost a full straightaway behind Goodale in third with Pennink and Silk making up the top-5. Goodale led Dowling to the checkered flag to win the Bud Light 80. Dowling finished second with Rocco, Pennink, and Cipriano rounding out the top-5. In the 40-lap SK Modified® feature, Tyler Hines took the lead at the green flag with Michael Gervais, Jr. all over him. Gervais nearly took the lead on lap-2 but settled back into line. Tom Bolles was third with Tony Membrino, Jr., side by side with Todd Owen for fourth place. Gervais took the lead on lap-5 and he had Hines, Bolles, and Owen lined up behind him. Eric Berndt was by himself in fifth with a host of cars lined up side by side behind him. 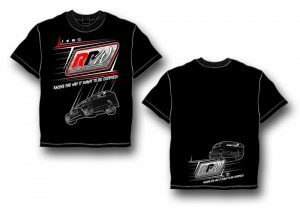 Keith Rocco got off track and went through the backstretch grass but he rejoined at the rear of the field and the race stayed green. Up front, Hines was back out front with Owen in second and Gervais in third. Bolles did a half spin coming off turn 4 but the race stayed green. Bolles then spun in turn 2 on lap-11 but the race stayed green. Owen took the lead from Hines on lap-13 with Berndt getting around Gervais to move into third. Berndt then took second from Hines on lap-14 with Gervais fourth, Chase Dowling fifth, and Ronnie Williams sixth. Berndt continued his charge to the front as he took the lead from Owen on lap-18 with a move in turns 3+4. Hines was still third with Williams now fourth and Gervais fifth. Dowling was sixth with Troy Talman right behind him in seventh place. The caution came out with 20 laps complete for a spin on the backstretch by Matt Vassar. Berndt took the lead back under green with Williams moving into second. Owen was third in line with Gervais in fourth and Dowling in fifth. Williams was hounding the back bumper of Berndt for the lead and he finally got a good run going into turn 3 on lap-25 and he took the lead. Dowling was applying pressure to Gervais for fourth place and he took that spot on lap-30. Talman followed suit one lap later to move into fifth but just as he made his move, the caution came out for a spin in turn 2 by Rocco and Michael Christopher, Jr. to move Talman back to sixth for the restart. Williams and Berndt were side by side for the lead with Owen and Dowling side by side for third. The caution came back out for a spin by Glen Reen in turn 1 with 31 laps complete. Dan Avery spun on the backstretch to bring the caution back out before a lap could be completed. Reen and Joey Cipriano got hooked together in turn 2 on the restart and spun to bring the caution right back out before a lap could be completed. The next restart saw several cars get out of shape mid pack with Dan Avery spinning in the middle of turns 1+2 to bring the caution back out. The fourth time as the charm as Berndt took the lead with Williams and Owen behind him but they only completed one lap before several cars spun in turn 2, including Dowling, Bolles, Christopher, Jr., and several others to bring the caution back out. Berndt took the lead with Williams and Owen behind him but after one lap, Stephen Kopcik spun going into turn 3 and collected several others to bring the caution back out with 33 laps complete. Williams had the lead at the line by a nose over Berndt and he got clear of Berndt on lap-35. Talman and Owen were now side by side for third while Berndt came back to the inside of Williams on lap-36 to retake the lead. John Catania and Christopher, Jr. spun in turn 3 to bring the caution back out with 37 laps complete. Berndt took the lead on the restart with Williams second. Owen and Talman were once again side by side for third with Rocco and Dowling side by side for fifth. Berndt and Williams came to the white flag side by side. They were still side by side down the backstretch with Williams backing off going into turn 3 to make a move to the inside of Berndt in turn 4. 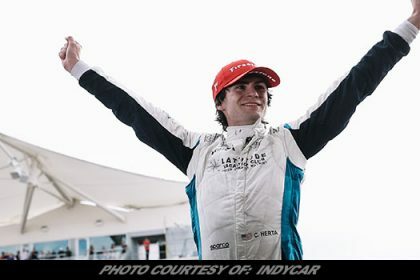 Berndt was able to hold off the challenge of Williams to take his first win of the 2018 season. Owen came home third with Talman fourth and Rocco fifth. In the 13-lap TC Shoot Out, Michael Christopher, Jr. took the lead at the green with Dowling and Cipriano side by side for second. Dowling shot into the lead on lap-2 with Reen following him by Christopher to move into second. Owen was now side by side with Christopher for third. Owen took the spot and Talman moved into fourth as Christopher began to slide backwards. With 5 laps complete the order was Dowling, Reen, Owen, Talman, Kopcik, and Cipriano. Reen made a move on nlap-9 to take the lead from Dowling at the line. Owen was right behind Reen and Reen got clear into the lead on lap-10. Owen and Dowling were now side by side for second with Talman in fourth. Owen got extremely loose in turn 3 coming to the white flag, giving Reen a margin. Owen collected his car and rejoined in third behind Dowling, but Reen couldn’t be caught as he took the checkered flag. Owen finished third with Talman and Cipriano rounding out the top-5. In the 30-lap Late Model, Paul Arute and Kevin Gambacorta got together and spun into the turn 1 wall to bring the caution out right at the start. Michael Wray powered into the lead on the second start but he was only able to lead the first lap before Tom Fearn streaked into the lead on lap-2. Wray fell back to second with Wayne Coury, Jr., Glen Reen, and Trace Beyer making up the top-5. 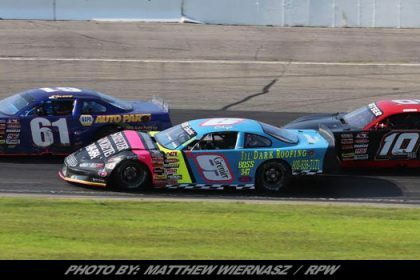 The cars ran in line until lap-7 when Coury made a move to take second from Wray that brought Reen into third and dropped Wray back to fourth in line. Arute had recovered nicely from his spin at the initial start and he took fifth from Beyer. The caution came out with 13 laps complete for Paul Varricchio, Jr., whose car was smoking heavily as it limped back to pit road. Fearn again took the lead on the restart with Reen, Coury, Tyler Leary, and Arute making up the top-5 with Wray in sixth. Fearn then led Reen, Coury, and Leary to the checkered flag to pick up his 8th win of the 2018 season. Wray got back by Arute on the last lap to round out the top-5. Bob Charland took the lead on the second start but Brett Gonyaw took the lead from Charland on the first lap. Andrew Molleur, Bryan Narducci, Marcello Rufrano, Mikey Flynn, and Charland were lined up behind him. Molleur and Rufrano were side by side for second on lap-5 with Narducci right on their bumpers. Molleur took the lead from Gonyaw on lap-6 with Narducci moving up to second. Rufrano and Gonyaw were now side by side for third with Flynn in fifth in what were a frantic first 7 laps. Narducci was looking to the low side of Molleur for the lead but Molleur was able to hold him off on lap-9. Narducci made a pass stick on lap-10 as he moved to the front of the pack with Rufrano moving into second to drop Molleur back to third. Flynn was fourth with Gonyaw back to fifth. Molleur got back by Rufrano and was all over the back bumper of Narducci, looking high and low for a way to retake the lead. Narducci was able to hold Molleur off and Rufrano went back around Molleur to take second on lap-15. With all the jockeying among the leaders, Flynn caught up to the three leaders and it was a four car train for the lead with 3 laps to go. Rufrano pulled alongside Narducci in the outside lane and as they took the white flag, Rufrano had the lead by mere inches. Narducci got clear of Rufrano going into turn 3 on the final lap and he held Rufrano off to the checkered flag to pick up his third win of the 2018 season. Molleur finished third with Flynn and Gonyaw rounding out the top-5. In the 20-lap Limited Late Model feature, Andy Marchese backed into the turn 3 wall on the first lap to bring the caution out. Gary Patnode took the lead on the restart with Duane Provost coming out of a 3-wide move in second with R.J. Surdell in third and Ryan Fearn in fourth. Provost took the lead from Patnode on lap-3 while behind him there was more 3-wide action between Fearn, Surdell, and Patnode. Fearn and Surdell touched with Surdell going around in turn 4 and collecting Marchese to bring the caution out with 3 laps complete. Provost took the lead on the restart with Jeremy Lavoie moving into second. Patnode was third with Justin Bren fourth and Surdell in fifth. Bren moved around Patnode to take over third on lap-6 and he brought Surdell with him into fourth as Patnode slid back to fifth. Provost held the lead until lap-13 when Lavoie took the lead after several laps of heavy pressure to the back bumper of Provost. Bren was third with Surdell in fourth and Fearn in fifth. The order held until lap-18 when Bren took second from Provost and Fearn got around Surdell to move into fourth. 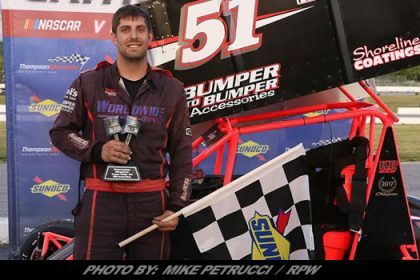 Bren couldn’t catch Lavoie as Lavoie scored his seventh win of the 2018 season. Provost finished third with Fearn and Surdell rounding out the top-5. In the 20-lap Street Stock feature, Tess Beyer took the lead at the green but Greg DeMone spun in turn 4 and collected Armand Cote, Jr. to bring the caution out with 1 lap complete. The restart saw Dan Soucie get into the turn 2 wall to bring the caution right back out. Tess Beyer took the lead on the restart with Jason Lafayette behind her in second. Nicole Chambrello was third with Brandon Michael and George Bessette, Jr. making up the top-5. Beyer took the lead back under green with Lafayette behind her. Lafayette spun on lap-12 but was able to keep going and the race stayed green. Michael was now second behind Beyer with Chambrello, Bessette, and Vince Gambacorta making up the top-5. With 3 laps to go, Beyer was still in command with Michael, Chambrello, Bessette, Gaqmbacorta, and Meghan Fuller all giving chase. Beyer led the field to the checkered flag to pick up her first career victory. Michael finished second with Chambrello, Bessette, and Gambacorta rounding out the top-5.